This page includes data that provide two perspectives on child abuse and neglect. The first data set, from the Wisconsin Department of Children and Families, include the number of reported cases of abuse or neglect of children under age 18. Child abuse can be physical, sexual, or emotional. Neglect is defined as failure, refusal, or inability on part of a caregiver—for reasons other than poverty—to provide necessary food, clothing, medical or dental care, or shelter so as to seriously endanger the physical health of the child. Additional information regarding out-of-home placements occurring between 2013 and 2017 can be found in the What's New section. 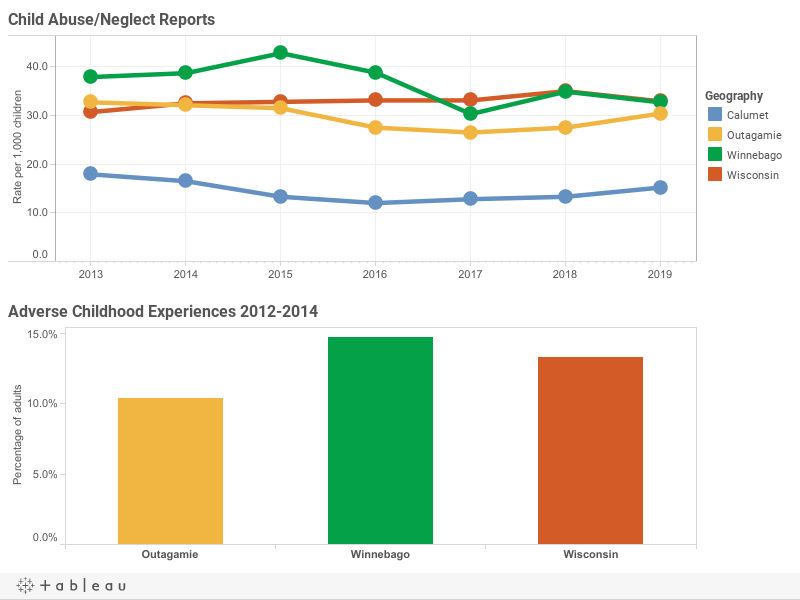 The second data set is from the Wisconsin Department of Health Services and includes the percentage of adults reporting in the Wisconsin Behavioral Risk Factor Survey that they had four or more adverse childhood experiences (ACEs). The ACE data for Calumet County is omitted because it is based on a sample size that is too small.